CHICAGO (Jan. 18, 2012) -- Representatives from posts named in April as pilots for the Army's Net Zero Installation Strategy are meeting here this week to brief their progress. "They have made a lot of progress, and that is what is encouraging to see," said Katherine Hammack, the assistant secretary of the Army for installations, environment and energy. Mark Dressler of Fort Detrick, Md., talks with Eric Stebel, of the Hunstsman Corporation, about the energy efficiency of spray foam insulation, during the Jan. 18-20, 2012, Net Zero Energy Installations Conference in Chicago. At the conference, representatives from installations named in April as pilots for the Army's Net Zero Installation Strategy, will discuss the progress of their installations. 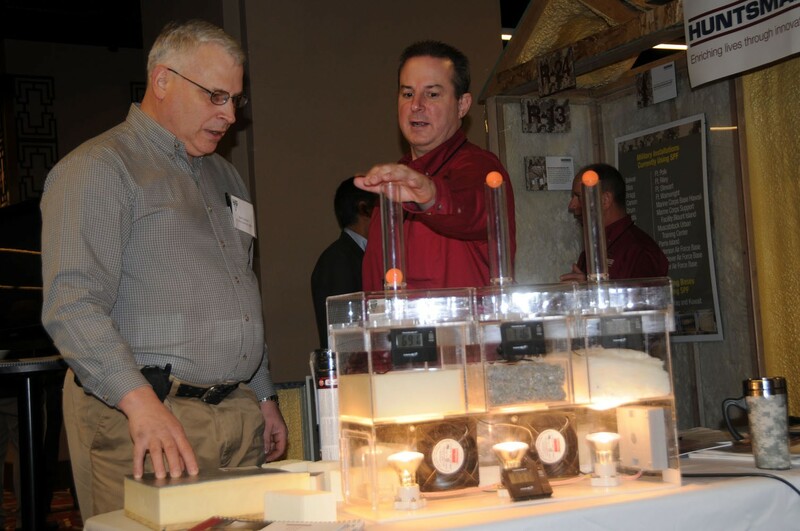 Hammack opened the three-day Army Net Zero Energy Installations Conference, Jan. 18, and said she hopes that in addition to briefing the progress of their home installations, participants will also learn from one another. "This is really all about networking and learning from each other," she said. "We have a lot of great, smart people doing wonderful things. But our Army installations can be in very diverse and remote locations. By bringing everyone together, they can learn from both the formal presentations, and from networking and talking with each other to understand how they may address something that was a problem at one location, but the other location figured out." The Army's Net Zero Installation Strategy focuses on three areas: energy, water and waste. For each of those areas, the Army chose six pilot installations. Some installations were named pilots in two areas. An additional two installations, Fort Carson, Colo., and Fort Bliss, Texas, were named as "integrated" Net Zero installations. Those installations will work on reaching Net Zero goals in all three areas. Representatives from 18 installations in all are at the conference to brief their home station's progress. The Army's Net Zero Installation Strategy is about reducing energy use, water use and waste production, to help secure the Army's mission. A Net Zero energy installation produces as much energy as it consumes, resulting in a net usage of zero. A Net Zero water installation limits its consumption of freshwater resources and returns water back to the same watershed, so as not to deplete groundwater. Finally, a Net Zero waste installation reduces, reuses, and recovers waste streams with a goal of zero landfill use. Part of the reasoning behind the Net Zero goal is that Army installations become self-sustaining, Hammack said. "Fire, earthquake or tornado can all shut down infrastructure like water or power to an Army installation and disable it," Hammack said. "All of those threaten the ability for us to do our primary mission. We have to address these threats and work to ensure that the Army of tomorrow has the same access to resources that the Army of today does." For an Army installation to meet the Net Zero energy goal, it must produce as much energy as it consumes. That is driven in part by the vulnerability of the power grid and the effect its failure could have on the Army mission, Hammack said. "Our power grids are increasingly vulnerable, and that exposes Army operations to risk," Hammack said. Power lines which supply Army installations are aging and easily accessible for those who might want to attack the Army. "Who would have thought ten years ago that somebody would fly an airplane into buildings," she asked. "Imagine somebody setting off a small bomb, and it doesn't take much, to cut down power grids and render our bases vulnerable and exposed. If a raccoon can do it, a terrorist can do it." The Army's risk management for that is both onsite production of energy, coupled with reduction in use by more efficient use of energy. Existing buildings also need to be looked at for energy-use reduction, she said, because decreased budgets mean new construction will slow, and the Army must look to existing construction to cut energy use. Decreasing use of fossil fuels means increased use of clean and renewable energy resources -- not just wind and solar. Determining which new technologies are best for each installation means assessments at those installations. Hammack said the Army is working with the national labs to develop roadmaps to help installations move towards Net Zero energy use. One such roadmap involves overall reduction in consumption coupled with an increased percentage of use supplied by alternative energy sources such as solar hot water, photovoltaic, geothermal, wind and biomass. 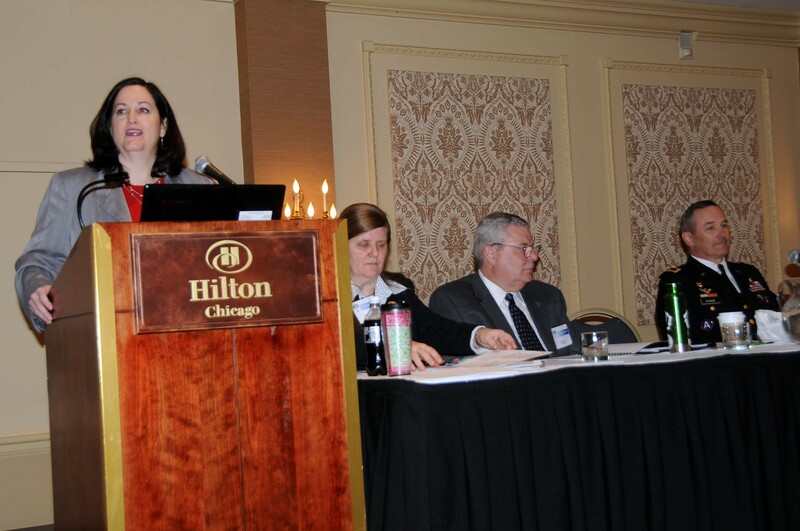 Katherine Hammack, the assistant secretary of the Army for installations, environment and energy, opened the Army's Net Zero Energy Installations Conference, Jan. 18, 2012, in Chicago. At the conference, representatives from installations named in April as pilots for the Army's Net Zero Installation Strategy, will discuss the progress of their installations. "It's going to take a balance and blend of resources to get us there," Hammack said. Net Zero installations must also reduce water use, Hammack said. Water is itself more important now because of water shortages and increased demand for fresh water. And Army leaders have said competition for fresh water will increase in coming years. "Some say that water will be more precious than oil in the 21st century," Hammack said, adding that only about three percent of the world's water is fresh. "If you think about an Army installation, where are you getting your water from? Is it a single point distribution? That is vulnerability and a risk," she said. Hammack said one installation discovered that, when it lost power due to a forest fire, it also lost pressure to its fire hydrants. That is something she said should have been known ahead of time. "We need to do vulnerability assessments and understand the critical nature that water has on our operations," she said. Net Zero goals for water require reduction of water demand. That can be accomplished through such things as treatment of used water to repurpose it for other uses, like irrigation. In new construction, Hammack said, it might also mean implementing more green plumbing technology. One surprising way the Army has shown it can reduce water, Hammack said, has been to reduce leaks that are the result of ageing water infrastructure. The Army must also look at continued access to water. The Army is looking at supply and demand studies to assess 30-year water demand on installations in order to determine if in the future there will be problems at those installations with getting water. Hammack said the Army's goals for Net Zero water include both reducing water demand on installations, and also ensuring continued water rights for installations into the future. Producing zero waste by reducing waste production and by reusing waste that is created is also part of the Army's Net Zero Installation Strategy. "Waste reduction doesn't mean send all your solid waste to incinerators," Hammack said. "Stuff coming out of an incinerator is waste too. Waste avoidance is a first step for reduction." That can be accomplished by repurposing materials, recycling and composting. "We have some installations that are doing fantastic jobs with recycling -- to the point where they are generating money that goes into MWR," she said. What goes on at these installations, she said, can be taken to theater to reduce the impact there on the environment and on Army operations.